I can't decide which of these cards I like better, so I'm asking your opinion. 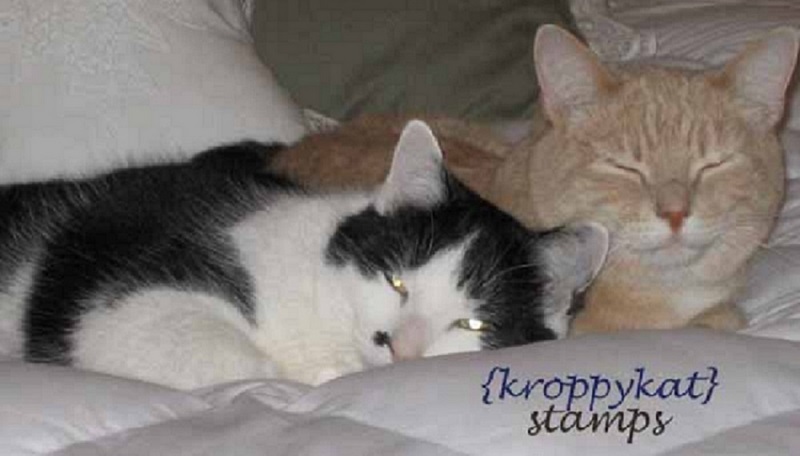 The main image of both is from Stampin' Up's recently retired Right At Home set. I used one of the houses from the stamp of three houses. I stamped on shimmery cardstock and colored both with Prismacolor pencils, shading around the edges with the pencils and adding a bling doorknob to one. The first card is mounted on SU Blush Blossom and Chocolate Chip and the corners trimmed with SU's ticket punch. The scraps behind the main image are a scrap made with a stamp from SU's Looks Like Spring and a scrap from SU dp called Spring Flowers (from one of the mini catalogs). The base card is Blush Blossom (also SU) and I ran the front of the card through my Big Kick using a Cuttlebug embossing folder, added some punched flowers (used SU's punch that matches Looks Like Spring) and a Queen brad and tied two pieces of ribbon around the dp for the finishing touch. 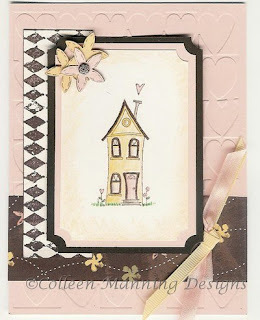 The second card uses mats of SU Pretty in Pink and Chocolate Chip for the house and more scraps from the SU dp and stamped scrap to create a custom paper. I took a plain scrap piece of paper and glued strips of the dp scraps in rows on the piece of paper and then cut a piece the size I needed for the card from that and put it on the SU So Saffron base card that I stamped in So Saffron ink with the Paisley BG stamp. I scalloped the edge of the card front with my scallop scissors and used the SU slot punch to add a piece of ribbon. The upper left corner accent is a Sizzlet Cut 'n' Emboss diecut. 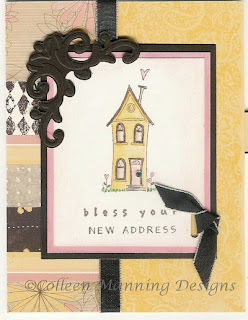 The sentiment is a combination of a Hero Arts stamp that says "Bless Your Heart" and an Amuse stamp that says "New Address". I like both of the cards. I think the second card makes a bigger impact when you look at them quickly. Definitely like the Sizzlet Cut "n" Embosse diecut. Need to get that one! Your blog is great and your cards so inspiring! Thanks for stopping by at travelingmama.net! I like both of them, however, I think the dark cut n emboss diecut is too dark and heavy and becomes the focal point of the card. Perhaps if it were a lighter color? I prefer the second card because of the flourish in the upper left corner - but it possibly could be a little bit lighter in color. Know What You're Getting On Your Birthday? ?